Have been many years since we tasted for the first time the authentic Scotch meat pie. Living in America gives the chance of trying food from different parts of the world, and the traditional Scotch meat pie conquered the palate of all and sundry. History tells that the Scotch pie was originating in Scotland, but it is finding all over the United Kingdom. The meat pie's right portion and taste make it the favorite snack for Scottish, Irish, British, and their descendants. The meat pie is a small double-crust filled with ground beef, spices, topped with a soft crust and baked. 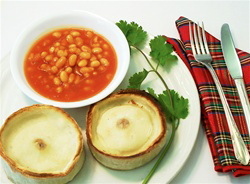 Scotch meat pies could be served as snacks or appetizers in parties or dinners, and can be storage frozen or enjoy them just baked; accompanied by your favorite HP Sauce or Heinz beans make the perfect taste of Scotland. In the United States, Traditional Scottish Food is enjoying mainly in New Jersey, New York, Connecticut, New England, Georgia, North-Central Nova Scotia, Maine, New Hampshire, Pennsylvania, Pittsburgh, Maryland, West Virginia, Delaware, North Caroline, South Caroline, Georgia. However, this popular pie is being enjoying through generations in every place around the globe where a Scottish heart bits. In Scotland Pies, beans & chips are a tradition; but pies by themselves with HP sauce are delicious. Heinz Beans and Batchelor peas are the other two popular combinations. Scotch meat pies and Heinz beans.